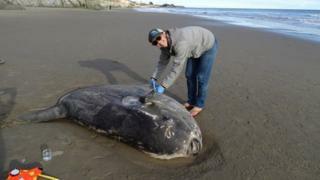 A rare fish thought to live in the southern hemisphere has washed up in Santa Barbara, California. The appearance of the seven-foot (2.1m) hoodwinker sunfish has baffled scientists, who question how the fish made it so far from its home waters. An intern at the University of California spotted the animal at the Coal Oil Point Natural Reserve. It took researchers several days to properly identify the creature, which was only discovered in 2014. Photos of the giant fish first appeared on the Coal Oil Point Facebook page, and experts from around the world weighed in to help identify the creature. The animal was named "hoodwinker" after its discovery after eluding researchers for so many years. Marianne Nyegaard, a marine scientist who found and named the fish, told CNN she "nearly fell out of my chair" when she saw the pictures of the beached traveller. "When the clear pictures came through, I thought there was no doubt," she said. "It's intriguing what made this fish cross the equator." The hoodwinker is larger and sleeker than other species of sunfish, weighing up to two tonnes (2,000kg). They reportedly favour more temperate waters, such as off the coast of Chile or New Zealand. A different form of sunfish appeared twice off the west coast of Scotland in a week last September.